How did Greece get into this mess? People often say that the problem in Greece is profligacy. Greece, the story goes, is a nation living beyond its means. Reading the press, in fact, one gets the impression that Greeks must enjoy one of the highest standards of living in Europe while making the frugal Germans pick up the tab. In reality, Greece has one of the lowest per capita incomes in Europe, much lower than the Eurozone 12 or the German level. Furthermore, the country’s social safety net might seem generous by US standards but is truly modest compared to the rest of Europe. As to borrowing, Greece is far from unique in its level of overall indebtedness as a percentage of gross domestic product. So what’s the real problem? It all started when Greece embraced the Euro, which some saw as the country’s salvation. But as is so often the case, what once seemed a strength turns out to be weakness. The same might be said of Greek social programs; once seen as a pillar of the state, in hard times they automatically swell government deficits. Remember that as Europe slid into recession, tax revenue fell and social transfer payments (such as unemployment benefits) rose, opening a larger gap between tax receipts and spending. The same thing happened in the United States. But the United States controls its own monetary policy. In Greece, which is stuck with the Euro, yawning deficits began to worry investors. With borrowing costs soaring, the country has embarked on an austerity program. Unfortunately, If the government lowers its deficit during a recession through spending cuts or tax increases, the strategy is destined to fail. Cutting wages and pensions, as the recent presidential decree declared, which is a large part of the imposed EU/IMF plan, or raising taxes for that matter, will only make budget deficits bigger by lowering national income and tax revenue. This will mean lower effective demand, which will exacerbate the already bad unemployment situation and potentially lead to more civil disturbances. Some analysts estimate that unemployment will increase by 6 percentage points as a result of the austerity package. More importantly, Greece continually imports more than it exports, and its firms and individuals spend more than they save (much like some large countries in North America that I can think of). Now, any country’s current account deficit plus its private sector deficit equals its government deficit. During recessions the private sector cuts spending and tries to save more. This automatically takes the government further into deficit territory as social programs grow and taxes fall. Bear in mind that when the current account goes into a deficit, which is a leakage out of private sector income, it means that unless the government deficit rises by the same amount, the private sector’s saving will fall. In the context of Greece’s high current account deficit, its private sector has been running a deficit for the past decade. Even though the macroeconomic accounting identity linking the sectoral balances is not a theory, it is a good way to analyze policy proposals. When some analyst says that Greece needs to lower its budget deficit to 3% of GDP, then looking at the sectoral balances one must ask, what will need to happen to the balances of the other sectors for this to take place? For example, in 2009, the Greek current account deficit was about 10 percent of GDP. The budget deficit including swaps was about 13 percent of GDP allowing the private sector to save at 3 percent of GDP. Without the option of currency depreciation, it is hard to imagine that Greece can boost its exports (and/or reduce imports) to the point of a balanced or surplus trade account—a swing of 10 percent of GDP. If the budget deficit is to be lowered to 3 percent of GDP to comply with the Eurozone’s Stability and Growth Pact limit, firms and households will need to run a deficit of 7% if there is no change to the current account balance. In other words, without a massive adjustment of its current account balance, the austerity plan can succeed only if the country replace public deficits with private deficits, and private debt buildup at this rate would certainly be unsustainable. It looks like Germany’s disciplined fiscal policy has been able to accomplish precisely this. Low levels of German government debt have been offset by high levels of private debt—arguably, more unsustainable than public debt. Ireland, Spain and Portugal are in a similar situation. Greece, on the other hand, has allowed its private sector to operate with somewhat lower levels of debt as the government’s deficit has risen relatively more. Indeed, the “profligate” Greeks have less private debt than that of their neighbors—which could place them in a better situation to withstand this crisis. Still, financial crises and recessions inevitably lead to larger public deficits and debts. The private sector deleveraging that occurs in recession must be accompanied by public sector leveraging unless the current account moves to the surplus side. Most developed countries, including the United States, United Kingdom and Japan, are in a similar situation in terms of their deficit and debt positions. But they have their own currencies. In the Eurozone, the issue is that the Stability and Growth Pact requirements are not rooted in any sensible theoretical arguments or empirical evidence. Countries have different export profiles and private-sector saving rates, and these influence the public sector’s balance. For European governments to be able to comply with the Stability and Growth Pact requirements at all times, they would need to abandon most of their social protection policies so that spending on the safety net does not rise in recessions. This would be counterproductive, to say the least. The bottom line is that the non-discretionary nature of Greece’s deficit does not leave many options for the government during bad times. There is no alternative to free-market capitalism, Margaret Thatcher used to say, and about this, like so many things, she was wrong. In fact a variety of alternatives are functioning quite well, and a number of them are succeeding by operating according to the principles of the Solidarity Economy. What is the Solidarity Economy? It’s a movement that has brought hope to a world disillusioned by capitalism and too often unaware that economic activity can be conducted with respect for human decency and the planet on which we live. Its five key principles are solidarity, sustainability, equity in all dimensions, participatory democracy and pluralism. Under the new financial reform measure hammered out by Congressional negotiators, mortgage lenders “will have to check borrowers’ income and assets.” Here it is, in black and white. A regular sea change. They stand out, don’t they? Things have been quiet in the Eurozone lately, but today the cost of insuring Greek government bonds set a new record by surging past $1 million (to cover $10 million for five years). The price is said to imply a 67 percent probability of default in the next five years. The full story is here. Should tax credits for homebuyers be extended? The clock is ticking and right now first-time buyers have to close the deal in six days. The incentive is sweet: up to $8,000 from Uncle Sam. The Internal Revenue Service reported that $12.6 billion was credited to 1.8 million home buyers (the final toll will be higher as transactions in 2010 have not been filed yet, not to mention the inevitable fraud). Calculated Risk, a highly regarded blog that tracks these matters, suggests that six months of inventory is normal in the housing market. For new homes, in May, the level rose to 8.5 months from 5.8 in April as sales plunged. Things are little better in the market for pre-existing homes; there we find 8.3 months of supply, in part due to the non-stop flow of foreclosures and short sales. From the data, it seems that the tax credit program has stimulated the market, at least a little, and for awhile. My question to you is, should our uncle in Washington keep the program going? Propping up shaky home prices may encourage private spending and support aggregate demand. Aiding the real estate market in lowering inventories may keep prices from falling further and generate some construction jobs. Reaching a “normal” level of inventories may improve everyone’s expectations and thus create a virtuous cycle of self-fulfilling recovery. The tax credit program may condition potential buyers to wait for another round of subsidies, thus delaying the very purchases we most want to accelerate.. The temporary subsidy may not be enough to sustain a high volume of transactions, and inventories may rebound (unless higher demand fueled by economic recovery takes place miraculously). Multiplier effects of the subsidy may not be enough to get us to a self-sustaining market. The program delivers benefits to people who can afford to buy home, and therefore is regressive. This regressivity implies high opportunity costs. The Bank for International Settlements has released its quarterly review (hat tip EconBrowser). 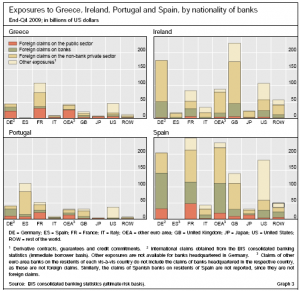 In it, you will find an interesting graph on page 19 (or page 23 including cover pages), titled “Exposures to Greece, Ireland, Portugal, and Spain by nationality of banks”. It’s reproduced here on the left (click on it for a larger view). I am puzzled by the relatively small size of public sector debt compared to the quite significant contribution of private sector debt in the countries discussed. Is fiscal austerity really going to be a solution? 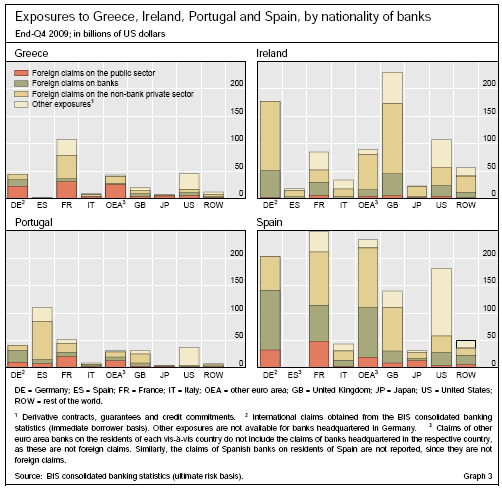 I wonder how in the world cautious German and smart French banks ended up with so much exposure to private debt in Spain. Of course, ingenious American banks are disproportionately exposed to financial products rather than straightforward debt. It seems financial reforms of different kinds are required in different places. The Economist takes a look at European austerity plans and finds…not much. Substantial cuts are happening mainly in the smallest Eurozone countries. Overall the impact is slight, although of course cutting anything at all is still the opposite of stimulus. Levy public policy scholar Daniel Akst argues in this op-ed that the rise of unpaid internships is exacerbating income inequality. These internships are perceived to offer important professional experience and contacts. Yet young people without money can’t afford to take them, which means kids without money are at a further disadvantage in applying later for desirable paid work. About a year ago, supply-side economist Arthur Laffer (known for the “Laffer curve,” a graph that depicted tax revenue first rising, then falling as tax rates increased) published an op-ed piece in the Wall Street Journal predicting sharply higher inflation and nominal interest rates over the next four to five years. The justification given for this claim was the rapid growth of the money supply, as measured by the Fed’s monetary base statistic, since the fall of 2008. One year later, inflation has not taken off. Meanwhile, the stock of currency and bank reserve deposits at the Fed has continued to grow rapidly, though growth has slowed markedly over the past year. The chart to the left (click on it for a better look) shows that Laffer’s preferred measure of money-supply growth has trended downward recently. It remained at about 100 percent, year-on-year, in the three months immediately following the op-ed piece. Since then, money-supply growth has remained in the double-digit range. However, there has been no discernible and sustained upward trend in nominal interest rates or inflation. Many recent events have conspired to keep these numbers at low levels. On the other hand, an argument can be made that the money supply itself is mostly a somewhat unreliable indicator of what is happening, rather than a crucial mover of the economy. About 40 years ago, economists Nicholas Kaldor and James Tobin, both followers of Keynes, published important articles arguing that changes in the “money supply” in themselves were probably not causes of economic growth or inflation, but instead a product of those forces. (This claim does not mean that interest rates do not play an important role.) Monetarists like Milton Friedman, who had long argued that the growth rate of the money supply determined the growth rate of nominal income in the short run and inflation in the long-run, had it almost completely backwards, according to this post-Keynesian view. Granted, the Fed chooses in a literal sense the size of its balance sheet by making voluntary asset trades, loans, etc., but as a practical matter it cannot consistently maintain an arbitrarily chosen money-supply growth rate. For example, the Fed usually targets the federal funds rate. This forces it to buy or sell just enough bonds to stay at the targeted interest rate, which affects the supply of Fed liabilities in often-unpredictable ways. Attempts by central banks around the world to set and meet targets for the growth rate of the money supply have been repeatedly frustrated and, worse, have often led to recessions. The Fed has recently expanded the range of assets it buys and sells in order to guide the economy, in what might seem more like a deliberate policy decision. (Mortgage-backed securities, longer-dated bonds, and some distressed assets obtained from failing firms and institutions are important examples of the types of assets currently held by the Fed in significant amounts.) One might assume that such purchases are well within the Fed’s power to control. But there is less discretion even in these actions than many observers seem to think. For example, in the Fed’s view and that of the federal government, a decision to ignore the AIG situation could have led to a wider financial panic, because it would have threatened investment banks and other companies with which AIG had done business. As Hyman Minsky pointed out repeatedly in his writings, working to alleviate and prevent financial crises by helping failing banks may be the most crucial of the Fed’s duties—more important even than setting interest rates. The recent crisis seems unusual only because it was by some measures the most serious challenge of its type in many years. Despite the unusual scope and size of the bailout efforts, the Fed’s overall approach set very few precedents, and wide-ranging efforts to stabilize financial institutions and markets could not possibly have been avoided without serious economic consequences, though perhaps the task could have been accomplished at a much lower cost. Such efforts have ineluctably led to the huge money-supply growth rates that are shown in the figure. Laffer pointed out that most of this growth was due to a dramatic increase in bank reserves. However, high levels of reserves will not lead to significantly increased lending unless financial institutions believe that more loans will be repaid with a profitable return, an eventuality that in the current situation will await stronger demand for American goods and services. Anyway, because of the weakness and fragility of the recovery, many fewer economists worry about excessive lending now than one year ago. Actions that the Fed is in effect compelled to take—either to meet an interest-rate target or to fulfill its lender-of-last resort function and similar obligations to stabilize the financial system—cannot be seen as fundamental causes of inflation. Doubtless, a failure to perform either of these key central-bank functions effectively could lead to a deeper recession and/or deflation. But even to the extent that the Fed is responsible for adverse economic outcomes, these are likely to be the result of mistakes in interest-rate policy and in stabilizing the financial system, which are best not thought of as erroneous decisions about the proper growth rate of the money supply.